The organisers of highly acclaimed technology conferences across Sub-Saharan Africa, yesterday announced that they have secured a wide-ranging selection of international and local partners for the 5th edition of Mobile West Africa, which is scheduled to take place between 21 and 23 April in Lagos, Nigeria. Organisations confirmed to sponsor and exhibit at the event include MTN Nigeria, Airtel Nigeria, Etisalat Nigeria, Eskimi, VConnect, Gidi Mobile, Opera Software, MoboFree, Uber, MyMusic, Basebone, Mozilla, Jovago, Wiko Mobile and MTech Communications. To secure MTN, Airtel and Etisalat – as well as international players like Mozilla, Opera and Basebone – and then have the support of key local stakeholders such as Eskimi, Gidi Mobile, MTech and MoboFree reflects the will within the industry to keep it moving forwards. The conference has come a long way in the last five years, more so than I could have hoped for, and I want it to continue to facilitate progress. That’s what we’re here for. I’d like to encourage anyone with a stake in the industry to come and contribute to the discussions. Since 2011, Mobile West Africa has been regarded as the leading technology event in the region. Each year, the conference brings together the best brains in the mobile ecosystem and covers the evolution of mobile data, products and services in West Africa. 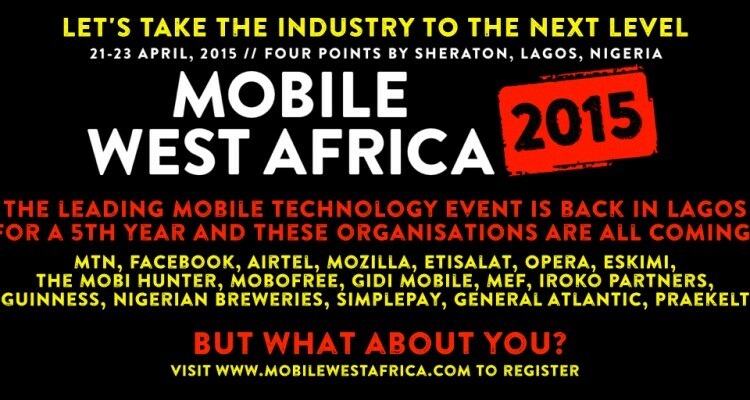 The Mobile West Africa 2015 agenda is available to view at the event website: http://mobilewestafrica.com. As is normally the case with All Amber conferences, it has been split into distinct sessions over two days. For 2015 these will include: The leaders of mobile; mobile gaming; universal access; mobile entertainment; local success case studies; mobile apps; mobile content, users & consumption; and for the first time, a session on the debate surrounding the future of mobile money. Next articleWhatsApp Phone Calls? The World Ends Here.